Center rack in oven and preheat to 350 F. Grease and flour two 9? round cake pans. Line the bottoms of each cake pan with parchment paper. Fit mixer with paddle attachment. In large mixing bowl, combine the sugar, oil and applesauce on low speed to combine. Add vanilla and pumpkin. Increase speed to medium and beat in eggs, one at a time, beating well after each addition. Gradually beat in flour mixture, mix until just combined. Turn off mixer and use a rubber spatula to scape sides and bottom of bowl, combine any dry ingredient traces. Pour batter into the two prepared pans. I use a large Pyrex measuring cup to see how much batter I have, then I separate according to the measurement to get equal layers. Sprinkle the chopped chocolate evenly over the top of each layer. Use a metal spatula (or your fingers) to gently swirl the chocolate into the batter without sinking it. Bake in preheated oven for 30-35 minutes, or until center of cake springs back to a gentle touch. Cool in pans on wire rack for 5 minutes. Loosen sides of cake from the pan using a metal icing spatula. Invert cake and remove parchment paper, then cool completely, facing up on wire rack. Fit mixer with paddle attachment. Beat together, on medium-low speed, cream cheese, powdered sugar and vanilla just to combine. Increase speed to medium-high and beat until creamy. Remove 2/3 of the mixture and set aside. Add 3 tablespoons of cocoa to remaining mixture and beat until completely combined and creamy. Set aside. Using the whisk attachment, beat heavy cream on medium high until it forms stiff peaks. Fold 2/3 of the whipped cream into the white cream cheese mixture. Fold the remaining 1/3 of the whipped cream into the chocolate cream cheese mixture. 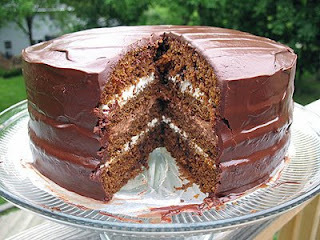 Cut each cake layer in half horizontally, using a gentle sawing motion with a large serrated knife. You may refrigerate the layers before doing this to make it even easier to cut. Line a cake plate with a piece of parchment paper. Place one of the layers, cut side up, onto the parchment paper. Spread half of the white cream cheese mixture onto the cake layer, spreading it out evenly and to about 1/4? from the edge. Sprinkle 1/3 of the chopped semisweet chocolate over the cream cheese filling and gently press it down with your fingers. Add second cake layer, cut side up, on top of first layer. Spread the chocolate cream cheese mixture onto that layer and sprinkle with another third of the chopped semisweet chocolate, pressing down gently. Add third cake layer (save a top layer for the top of the cake), cut side up, and spread with the remaining white cream cheese mixture. Sprinkle with remaining chopped semisweet chocolate and press gently. Position last cake layer on top. Position a glass bowl over a saucepan of simmering water, bowl should not touch the water. Melt bittersweet chocolate in the bowl, stirring often, cook only until just melted. Remove from heat and add in powdered sugar and butter pieces. Whisk gently until smooth. Pour glaze onto the top of the cake. Using a metal icing spatula to spread the glaze to the sides, allowing it to drip down the sides. Use icing spatula to spread glaze evenly across the top and on the sides of the cake. Allow glaze to set. Can be kept at room temperature, but if you will have it longer than a day, should be stored, preferably covered, in the refrigerator. Will last a few days, should be brought to room temperature before serving for best flavor.